No honking, just calm! calm! calm! Read the last post of ways to reach Matheran, and one of the best toy train journey not to be missed "Matheran Toy Train". This post is all about the lookup points to visit in Matheran, and some important notes while visiting Matheran as per my experiences to Matheran. Below album has more number of snaps taken at these points. Points in Matheran [*Recommended Point] [Important sites to visit in Matheran]: As soon as you park your vehicle at Dasturi naka, and enter to Matheran, you will be welcomed by the army of horses around you. Riding as per choice of Black, Brown, White, Tall or Short horse and the muddy slopes of Matheran is amazing to experience. There are altogether 36 points, 2 lakes, 2 parks, 4 major worship places and a race-course to visit inside Matheran. There are a lots of lookout ''points'' that provide long walking tracks, spectacular views of the surrounding hills and valleys. Matheran has a reasonably dense forest cover, lush greenery, waterfalls and the lake full with water. Being a hill station it is pleasant almost throughout the year though the nights can get a bit chilly. All the points give a unique view experience and you can’t miss that. 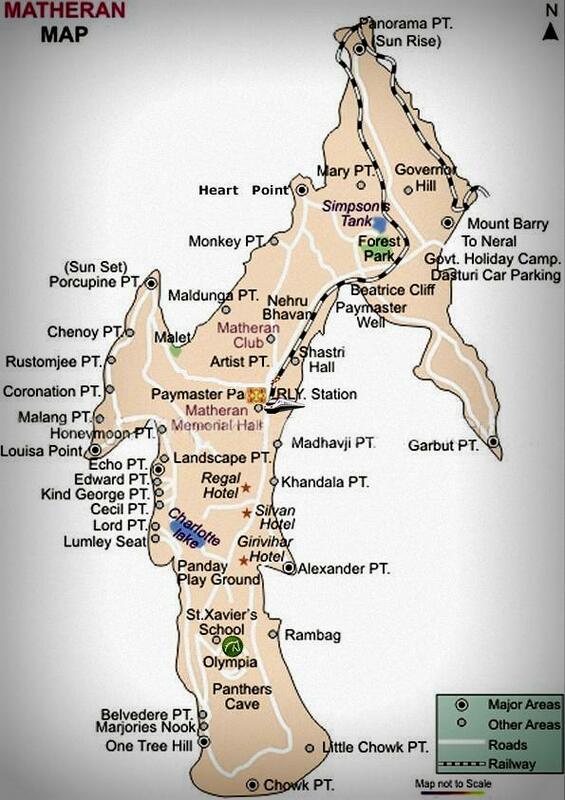 The following is a list of some major places of interest, I listed as per my experiences in Matheran. "Day 1 starts"
*Khandala Point: The point is very close to the Matheran Market Place, you have to step down some scrumbled stairs to reach the place. Adore the Garbut Point in front of it and at the right side of it, Khandala Hills, Bhivpuri Power House and Karjat town can be seen. *Alexander Point: During the Mansoon, the view of water fall will delight the hearts. *One tree Hill: On the top of hill there is one solitary Jambhul Tree that marks the spot. If you want to skip this point, you can directly traverse from Alexander to Charlotte lake. *Charlotte Lake: Lake is 1.5 kms away from the main market. Matheran receives water from this lake. Charlotte Lake has dam at one end and main Hindu holy temple (Pisarnath Temple) at the other. A spectacular waterfall overflows from the lake during and shortly after the monsoons. This is a popular picnic spot, it looks splendid in the monsoon, but dries up in the summer. We experienced lake crossing. *Lord's Point: It is just near the Charlotte lake, and must visit place. It is said "The journey wouldn't be complete till you visit this splendid point." *Echo Point: which really does have an echo, Valley crossing activity is operated by experienced people, we enjoyed the adventure as well. Love birds used to express their feeling not by flower or down on the knees but they shout it out at top of their voice. *Honeymoon Point: There is 30 seconds adreline valley crossing (approx 900 feet, 1000 feet deep) activity started that leaves you to Louisa point. Feel free to scream loud at the point and hear the echo coming from distant places through the valleys. Simply awesome!!! *Louisa Point: The place is essentially a plateau with views of the ruined forts Prabal and Vishalgarh. On the right side, one can see a shaped like a ’’Lion’s Head’’. *Sunset Point (Porcupine Point): It is about 5 kms. from main market. It is well known for the magnificent sight of Sunset from here at dusk. 'Prabalgad' fort can also be viewed from this point. Deep forest surrounds this place. Malet Spring: During whole year passers by and tourists can drink the cool water of this spring. Back to market and have dinner and chillax there. "Day 2 starts"
*Sunrise Point (Panorama Point): Almost 5.5 kms away from the market place. Early risers should head to Panorama Point to take in a spectacular sunrise. This point commands one of the widest views of the hill, both of Matheran and other side of it. While going to this place one meets with a wonderful alliance of sky with the horizon. Mount Berry: A splendid view of train coming up the hill and perfect aerial view of Neral Town can be seen from here. Mount berry is one of the highest points in Matheran with its splendid views. *Heart point: On clear nights, This point offers a view of the lights of Mumbai at night! 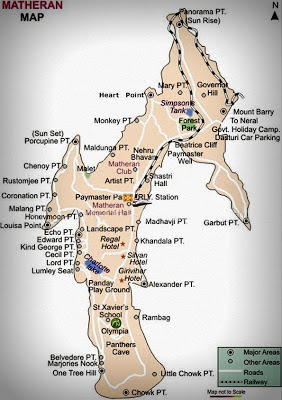 Monkey Point: It is about 3 kms from the Post Office and so named because there were monkeys abounding on that side formerly. The Marketplace: A very common sight, You can enjoy numbers of monkeys leaping from tree to tree or climbing the housetops. The market area is the bulk of the activities, where you will find good quality Shoes, Slippers, Sandals and other leather goods at good bargains here. You also get various flavors of Chikki, local honey, fudge's ice gola's and various drinks. You can explore the points as per your longivity of stay in Matheran. If you still have some energy to trek, you can follow the train trek from Matheran station to Dasturi Naka while enjoying valley views by foot. While returning we all opted for horse riding from Matheran market point to Dasturi naka on the red-mud road. - Don't plan to come or cover the place in a day. If you would like to see all of them then you may need to manage 2–3 days on your feet from your busy schedule. - Please carry enough cash with you, as many place don't accept cash and there is only 1 ATM nearby railway station, that even sometime doesn't work. - Carry flashlight as it becomes dark early near the forest areas. - Don't carry eatable open, else monkeys wouldn't leave you. As soon as you enter, You will get to know. - Don't book hotels in advance if you are not sure, as sometime that can be at a unwanted remote location away from market area. - The area is subject to frequent power outages, so try to have a stay where you get a generator to supply backup power. - If you want to travel with toy train, it is advisable to book the tickets in advance, as the train fills up very quickly. - I suggest you to take horse ride of only one hour to experience horse ride, rest of sight seeing will be easily manage by your foot only that gives a unique view experience. - Carry proper trek shoes with thick soles as Matheran is quite dusty and there is red soil everywhere. - Carry extra pair of clothes, as it rains heavily during monsoons. - You can trek right down from Matheran station to Dasturi naka then further to Neral station, either following the ghat roads or the toy train tracks. The best would be to combine both the routes for the spectacular views. This trek will take around 3 hour. - Avoid carrying too much baggage with you, but carry ample amount of water with you. The place is amazing. u hv amazng pics... 2 days visit seems less to enjoy the place, enjoy the full week. One of the best places to visit during monsoon near pune. loved it, thanks for sharing important info. Thanks +Raj Patil for your comments and good to hear if this helped you more. Nice Information and good collection of photos. Matheran is perfect place to spend holidays. Eco-friendly environment of matheran attracts the tourist. Plan your weekend at matheran and get relaxed from daily life. You can choose budget hotels in matheran for accommodation. Realbly Very beautiful place. even u can enjoy in summer. Nice detailed post. Thanks for so much detailed information about Matheran. it really helpful.we just like the post, photos, details and all. I recently shifted to Mumbai,now i will visit matheran again and again. i would like to see in Jul-Aug.